An airport luggage handling tote, a multi-cavity tray, a mailroom letter tray, recycling container or a host of other ‘standard’ items? Because we manufacture to your needs, we can offer different colors and printing. So we ask you, what are you looking for? While Kiva Container does not stock manufactured product, we do stock the raw material that represents the foundation for those items. It allows ultimate flexibility within our raw material storage – if you need a US Postal bushel bin, having a recycling container won’t do you much good. We have tailored or stock material for efficiency in producing standard products. We have both formed and fabricated standard items. 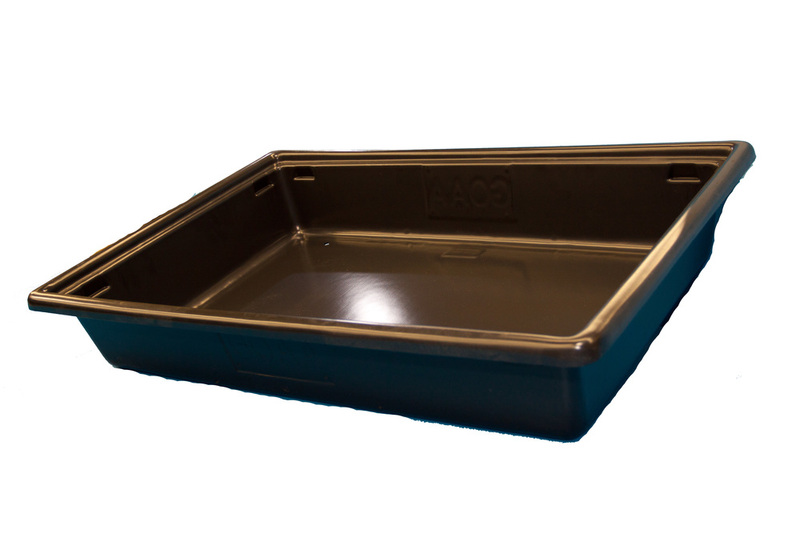 These baggage handling tubs have become the standard in the industry for luggage screening. Originally developed by Kiva Container (CP Products) for John Wayne Airport these luggage totes have now been integrated into airports nationally and internationally. They are avaiable in standard sizes (below) as well as custom sizes as need be. Your standard yellow wet floor signs. One side is in English, the other in Spanish. These can be customized with custom colors and logos if needed. Standard mail room nestable tote. Available in many custom colors Dimensions are 18 x 13 x 11. Our recycling bin has become a huge hit in the recent years. Standard size is 15 x 15 x 30, black with white letters. These can be customized with different print colors and different material colors. We carry a wide range of standard conductive hinged lid boxes. Sizes all the way down to 2 x 2 x .125 all the way up to 5 x 7 x 1.75. Most sizes are in stock.